EPX residents engaged in the city’s latest recycling and waste reduction tactics this week. 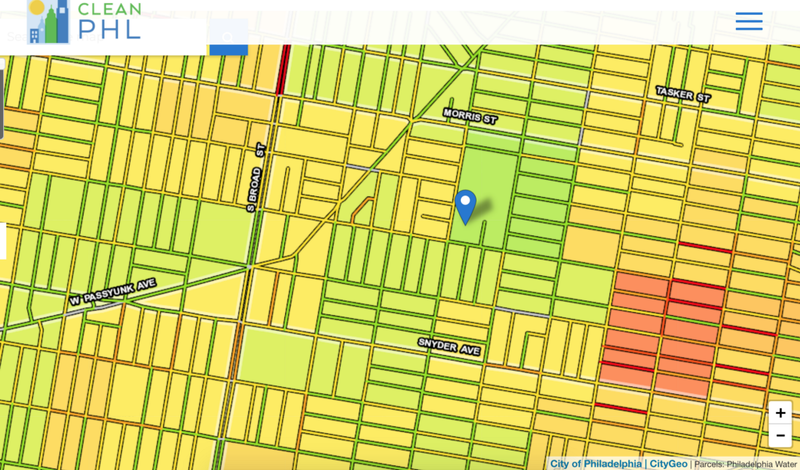 A screenshot of East Passyunk Crossing’s litter index on cleanphl.org. The block-by-block evaluation is part of the city’s Zero Waste and Litter initiative. At its latest general meeting, the East Passyunk Crossing Civic Association hosted a presentation on the city’s Zero Waste and Litter Cabinet. Nic Esposito, director of the cabinet, led a discussion with residents about various initiatives, issues and solutions related to improving sustainability not only in their neighborhood — which covers Broad to 6th streets and Tasker to Snyder — but across the entire city. The cabinet, which is chaired by the city’s Managing Director’s Office, was created through an executive order by Mayor Jim Kenney in December 2016, striving to not only reduce litter and promote recycling but to also encourage the long-term objective of fully eliminating Philly’s use of landfills and conventional incinerators by 2035. In reaching this goal, the city will reduce waste generation and increase waste diversion by 90 percent over the next two decades, according to Esposito. The remaining 10 percent of this figure, which is based on 2015 waste totals, will be utilized as waste-to-energy, like burning trash for electricity, as Esposito says. Currently, the majority of the city’s residential trash ends up at the Covanta plant in Chester. The cabinet’s chief component is its “interdepartmental” approach toward the zero waste goal and overall cleanliness of streets and public spaces, encompassing the efforts of City Council, major city departments and agencies, and community stakeholders. Within the weaving of these entities, five subcommittees focus on particular efforts, including waste and reduction diversion, litter enforcement and cleaner public spaces, behavioral science, communications and engagement, and data. Over the last year, 37 staff members from different departments, such as SEPTA and the Philadelphia School District, took 42,000 data points throughout the entire city, creating litter index scores on a block-by-block basis. This revamped version of the Street Department’s 2007 index uses aggregated scores of 1 to 4 — one being the most clean — in determining the severity of trash. Residents can view the status of their streets on a interactive map by visiting cleanphl.org. The majority of the East Passyunk Crossing, or EPX, area lingers within the green and yellow shadings, averaging a litter index neighborhood score of 1.33. The East Passyunk Community Center Building, located at 1025 Mifflin, averages a litter index block score of 1.58, according to the Clean PHL website. The southeast corner of the EPX boundaries reveals slightly more concerns with a 2.33 litter index neighborhood score. “We want to see not just what’s going on in a block but what’s going on in a whole surrounding neighborhood and even in a surrounding area,” Esposito said. By honing in on individual blocks, Esposito says the city can better determine the interconnection of accumulating litter in neighboring lots and schools. Last summer, the litter enforcement and cleaner public spaces team established 31 recommendations for residents to reduce litter and increase compost and recycling habits. The tips were brainstormed within the boundaries of city ordinances, laws and policies, centering upon three essentials — if it works, if the city can do it and if it is worth it. The tips, published online at cleanphl.org, include short-term priorities such as increasing short dumping fines, as well as long-term goals, such as creating an environmental crimes unit within Philadelphia Police Department Neighborhood Services Unit. Recently, the cabinet instituted a Building Waste Audit Program, which requires city-owned and operated facilities throughout Philly to submit an annual Waste Audit Reporting Form, focusing on how much waste is produced and where it ultimately goes. After an inhouse pilot that focused on 475 municipal buildings, including the East Passyunk Community Center, Esposito says the city found serious omissions in its sustainability system, such as certain departments lacking recycling contracts with the city. Currently, the city has tens of thousands of commercial buildings filling out similar recycling plans forms, which will be converted into the audit plans this fall. Buildings must publicly post their results and install proper recycling signage. A major part of the cabinet’s path to zero waste is engaging the public on waste reduction and diversion, as several EPX residents brought up concerns about litter in their immediate area, particularly from public schools. “There must be some way to reuse or at least more sensibly and sustainably dispose of the food,” said Beth Dougherty, corresponding secretary for the association and the community schools coordinator at Southwark, located at 9th and Mifflin. Along with witnessing poor composite procedures at the school, she notices a lack of recycling in several public schools. Esposito explained that while every Philadelphia public school has recycling capacity, the official procedures ultimately fall upon individual school administration. He also said the city maintains a food recovery program in all of its rec centers in which food cupboards can obtain leftover items — a system the city hopes to implement in schools. Joseph F. Marino, an at-large committee member for the association, said the East Passyunk Community Center has its own in-house recycling system, as the center’s leftover food for kids is given to local seniors on fixed incomes. Residents also voiced concerns about trash buildup on storefronts with prepared and packaged food. Leon Malloy, president of the association, said during its zoning meetings, the group stresses the lawful and environmental need for trash cans installed at such businesses. A city law requires cans must be placed within 10 feet of the entrance to the business during the business’ normal hours of operations, according to the city’s Business Services. He also noted the EPX Civic Association gives free recycling bins to residents, which they can access at www.epcrossing.org. “What really makes Philadelphia stand out is — community engagement is not something that was thought of afterwards … we built community engagement into the plan,” Esposito said. The next general meeting for EPX Civic Association is is scheduled for Monday, June 4, starting at 7 p.m. at the East Passyunk Community Center.